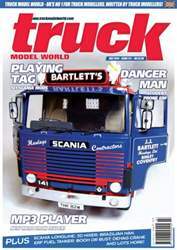 This month we review the new Mercedes-Benz Actros MP3 from Italeri, build a classic TIR tilt trailer, and bring you the second part of the spare parts Bedford TM wrecker. The last instalment of the Love Machine Mack Cruiseliner concludes with the livestock trailer as seen in the movie Convoy. After a 15 year break, one modeller returns with a bang and builds an award-winning ERF Olympic, and other award-winning models include a scratch-built Demag crane in 1:24 scale, and a cement mixer trailer build from 3-D printed parts. 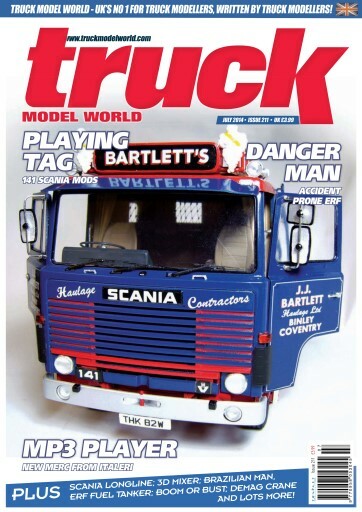 An unusual Brazilian/Chinese truck is featured, along with an all-purpose recovery unit, and our front cover shows a classic Scania 141 tag axle in a classic livery.